For many years the Leiden antiquarian bookseller Rijk Smitskamp was a key figure in the world of Islamic manuscripts and books. At his retirement he donated his extensive business archive to Leiden University Library. 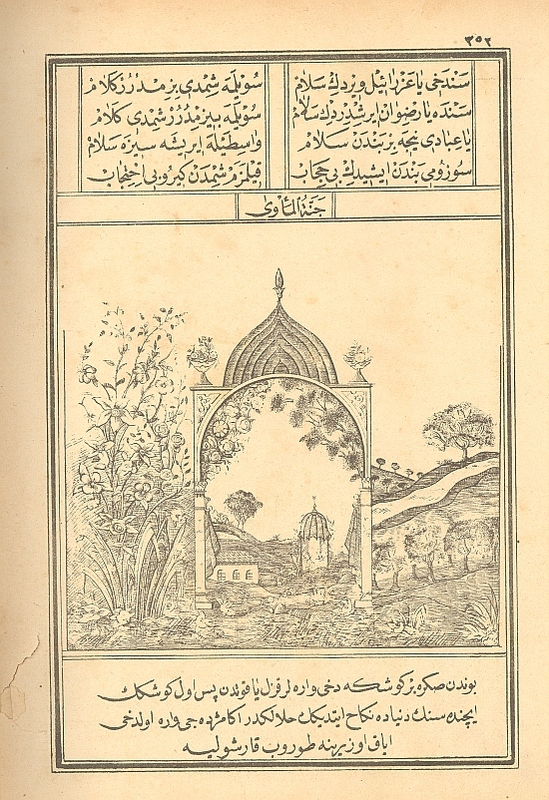 Recently, he showed his generosity once more by donating three 19th-century copies of the Muhammediye, a popular devotional work from Turkey with strong mystical overtones on Islam and the Prophet Muhammad. The author, Yazıcızâde or Yazıcıoğlu Mehmed, died in 1451 in an odour of sanctity. According to tradition he lived in a cave and abstained from eating cooked food for a period of seven years. The Prophet Muhammad supposedly visited him in a dream and asked him to write the Muhammediye, a request the author could not possibly refuse. The book, entirely in rhyme, is a triptych on Creation, the Mission of the Prophet and the End of Times. The book has always enjoyed great popularity, especially among elderly ladies. Between 1846 and 1910 twenty editions appeared in Istanbul with illustrations that grew more lavish in the course of time. With its bower and flowers, the ‘Cennet ül-Me’vâ’, one of the Gardens of Paradise, appears to be eminently suitable for an elderly Turkish lady from the 19th century.